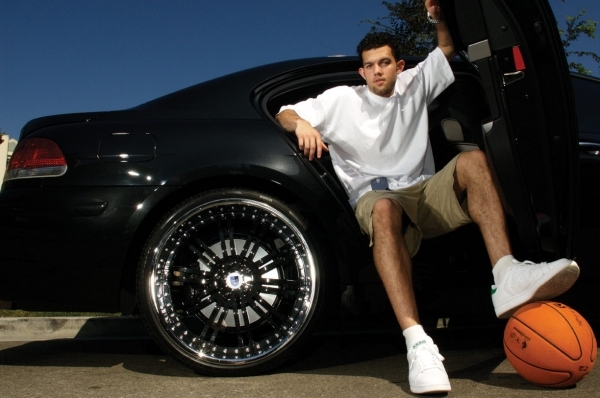 Here is Jordan Farmar of the Los Angeles Lakers sitting in the backseat of his black BMW 750. The wheels he chose are 22″ Asantis – black center with a chrome lip. Sorry to break it to you Jordan – but this is a very old style. Black Centers with Chrome Lips on Black Cars have been played out for a while now. You should have got the Black Lip with the Chrome Center. Every 2004-2006 black BMW I see in Los Angeles has these exact Asanti wheels with the black center and chrome lip. Be original people!